In the region of Katsanochoria, near the village of Fortosi and over the wild water of Arachthos rives has been built the beautiful stone bridge of Politsa. It has four arches with its central arch having about 14 metres altitude and 24 metres length. 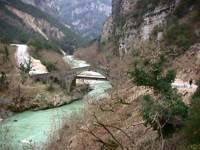 It was built by builders from Ampelochori, while in 1874 I.Loulis gave his money for the conservation of the bridge. Very close to this beautiful bridge you will find the modern one of today.